Ohiopyle rail~trail, a photo by ladywriter47 on Flickr. This entry was posted in Rave and tagged Ohiopyle, Ohiopyle bike trail, Ohiopyle Pennsylvania, Rail-trails. Bookmark the permalink. Thank you for the reminder of a a lovely poem with a lovely image, though I am glad it was not a snowy evening, yet. Me too! Not ready for snow by a long shot. 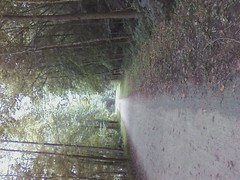 But I always think of that poem when I’m riding on a trail in the woods.